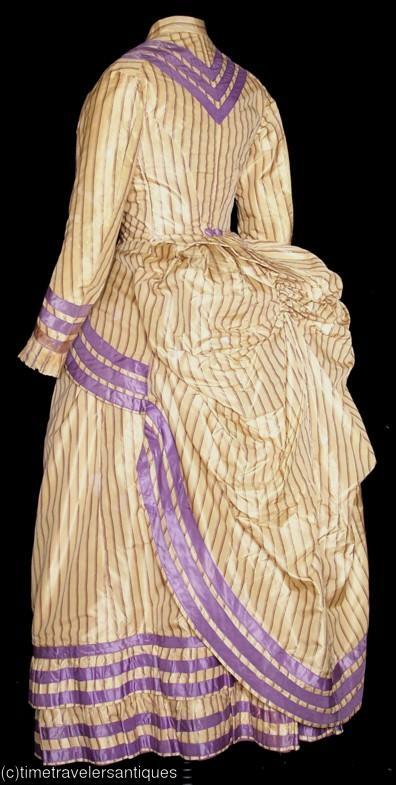 A striking original circa 1882 young lady's two piece striped silk taffeta bustle dress in a golden yellow accented in lavender. A lined and stayed polonaise style bodice with a bunted bustle and self fabric buttons to the front closure. The lined skirt has a back opening with no fastener, and matching lavender trim at the two tier ruffled hem. 14" from shoulder to shoulder, a 33" bust, 24" waist, and 49" from shoulder to front hem. In clean as found condition, with scattered light moisture spots, a tear in the crinoline bustle lining, perspiration color to the cuffs, sleeves, and underarms, some surface wear at the button holes, a 1" irregular surface hole at one shoulder, one 1" L shaped tear in the folds of the bustle, along with some tiny scattered age flaws from normal use. 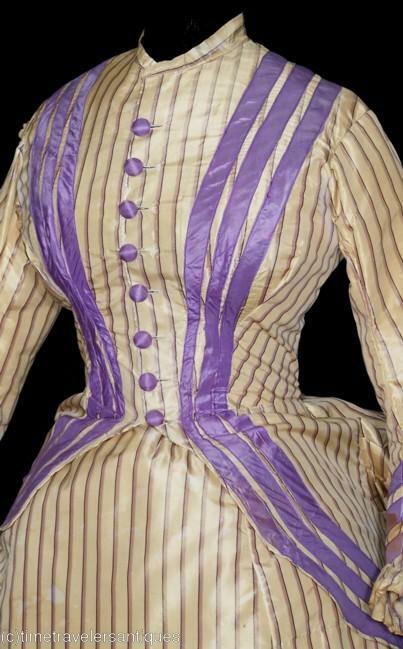 All is reflected in the reserve price for this colorful Victorian era bustle dress.